Most Rev. Francisco M. De Leon, D.D., M.S. The first missionaries of Antipolo were the Franciscans. The first church in what is now Antipolo City was built by the Society of Jesus under Rev. Juan de Salazar. The Jesuits administered the Church from 1591 to 1768. Built by Reverend Juan de Salazar, S.J., the church was ready for the image of Nuestra Senora dela Paz y Buen Viaje in 1632. However, the church structure was greatly damaged during the Chinese uprising in 1639 and the earthquakes of 1645, 1824 and 1863. The church, meant to house the image of Our Lady of Peace and Good Voyage brought by then-Governor General Juan Niño de Tabora, was supposed to be built on a different plot of land. The church's present location was the site of the tipolo (Artocarpus blancoi), top which the image was found after mysteriously vanishing several times. The church was completed in 1632, but suffered severe damage in 1639 when the Sangley (Chinese) set fire to the church in a revolt. It was restored afterwards though it was damaged by the 1645 Luzon earthquake, and other earthquakes in 1824 and 1863. Nevertheless, the church became a popular pilgrimage site as many devotees paid reverence to Our Lady of Peace and Good Voyage, including Philippine national hero and polymath José Rizal, who visited the shrine as a boy with his father, Francisco Mercado, on 6 June 1868. The pair went on pilgrimage to fulfill a vow Rizal's mother, Teodora Alonso, had made when she and the boy survived his delivery. Towards the end of the Second World War in 1945, the church was destroyed by Allied bombardment meant to liberate the area from the Japanese imperial control. After the war, a campaign was organized to build a new church, with the fundraising committee headed by former First Lady Aurora Quezon and Antipolo parish priest, Francisco Avendano. Architect José L. de Ocampo was commissioned to design the new shrine, which was completed in 1954. On 14 January 1954, the Catholic Bishops Conference of the Philippines declared the new Antipolo Church as declared the National Shrine to Our Lady of Peace and Good Voyage. The church was elevated to the status of cathedral on 25 June 1983, upon the canonical erection of the Diocese of Antipolo. The pilgrimage season for the Cathedral is initiated yearly by the "Pagdalaw ng Ina sa Anak" (Visit of the Mother to her Son), a motorcade bearing the image of Our Lady of Peace and Good Voyage from Antipolo Cathedral to Quiapo Church where the Black Nazarene is enshrined. A Welcome Mass is held in Quiapo Church at 9:00 in the morning. At 6:00 p.m., the farewell mass is officiated and after which the Penitential Walk from Quiapo Church to Antipolo Cathedral commences, distance is close to 33 kilometers. On the 1st of May of each year, the arrival of the Image of Our Lady of Peace and Good Voyage at the Cathedral is celebrated by a mass at 5:00 in the morning. Every 1st Tuesday of May, a procession of the Statue of Our Lady of Peace and Good Voyage starts at 7:00 a.m. from the Cathedral to Pinagmisahan Hill where at the end, a mass is held there. It was here on May 3, 1947, the Feast of the Holy Cross, that a wooden cross was blessed and erected. Since 1947 to the present, a commemorative thanksgiving mass is said very First Tuesday of May, the start of the Pilgrimage Season ending on the First Tuesday of July. High altar, with the image of Our Lady of Peace and Good Voyage enshrined behind glass. ^ "Diocese of Antipolo". CBCP Online. ^ a b "History". Antipolo: The City of Pilgrimage. ^ Mercado, Monina (1980). Antipolo: A Shrine To Our Lady. Makati: Craftnotes for Aletheia Foundation. ^ Jose Rizal University (2004). 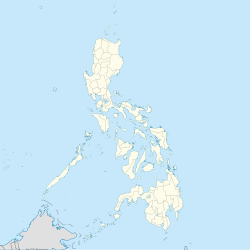 "In Calamba, Laguna". JoseRizal.ph. Retrieved 1 May 2015. 6 June 1868 With his father, Rizal made a pilgrimage to Antipolo to fulfill the vow made by his mother to take the child to the Shrine of the Virgin of Antipolo should she and her child survive the ordeal of delivery which nearly caused his mother’s life. Wikimedia Commons has media related to Antipolo Cathedral.